2014 ღ A Wonderful Year in Review! The 2014 school year has been one filled with many memorable moments and fabulous student achievement. As I look through the archive of our class blog and our international, collaborative Yollis' 365 Project, I am filled with pride. My Students Present at the Texas Google Summit! Thank you, Amy Mayer, for inviting us to present! Thank you Julie Hembree for the nomination! 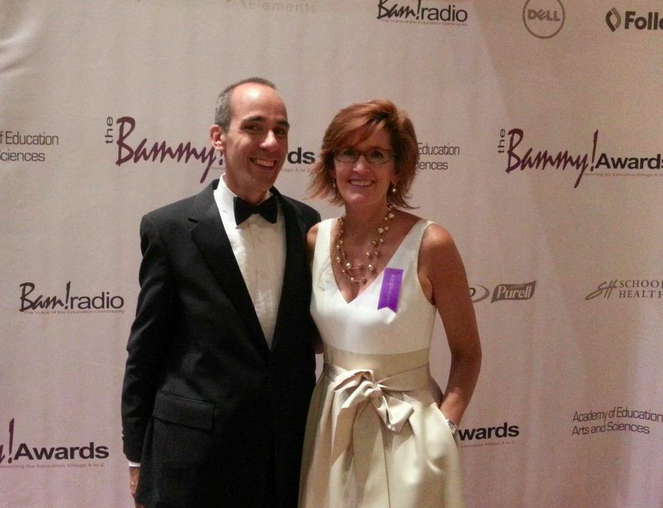 Congratulations to Todd Nesloney who took home the BAMMY! Well deserved! 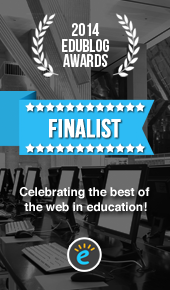 The BAMMY Awards honor the good things that are happening in education, and it was a highlight of my profession career to be named a finalist. What a lovely night for education! 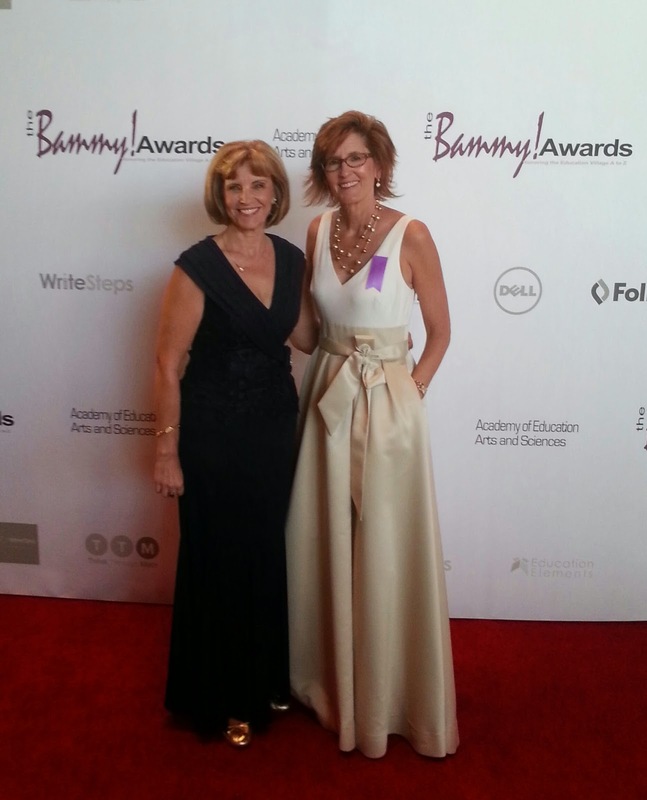 My principal accompanied me to the red carpet event in Washington, D.C. 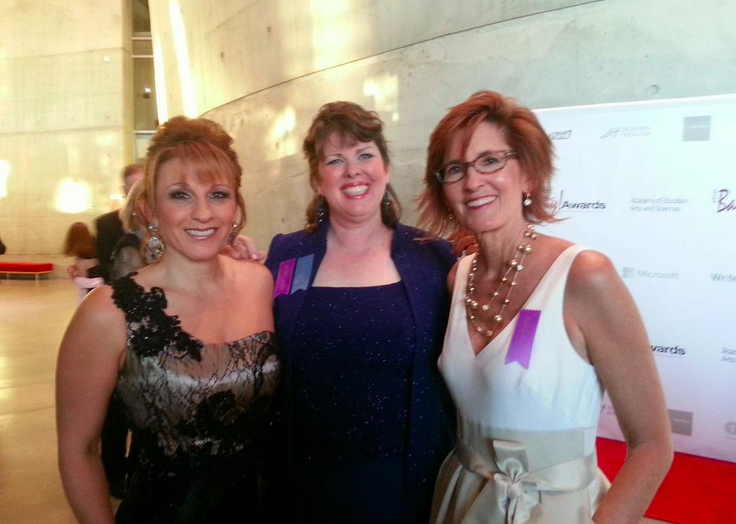 While there, I got to spend some time talking with educators I deeply admire, like Angela Maiers and Vicki Davis. I also got to spend some time with my friend, Daniel Beaupre, from National Geographic. Daniel Beaupre is the creator of the National Geographic Giant Traveling Maps series. 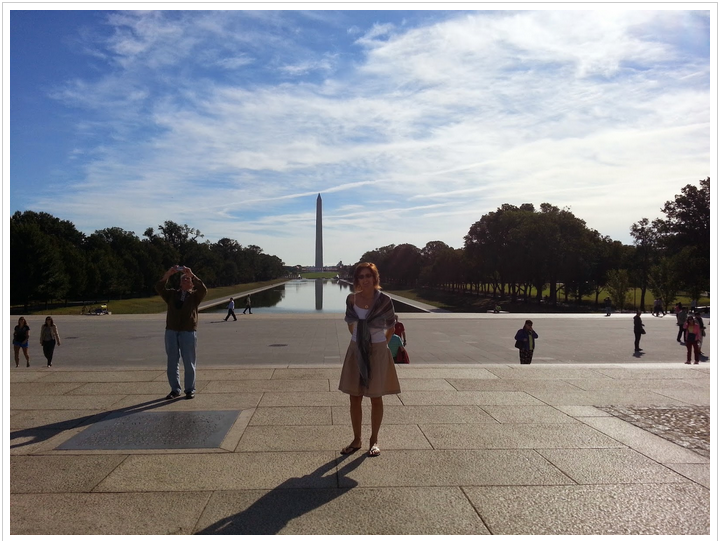 My students helped me plan my time in Washington, D. C.! 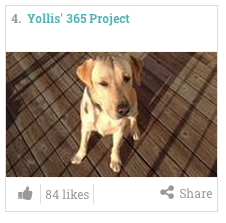 Our Yollis' 365 Project landed in fourth place for Edublog's Best Group Blog! I have had a wonderful year! 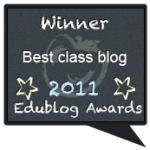 I'd like to send out a hearty thank you to the friends and family who support my students on our blogging journey throughout the year. And to my positively perfect PLN, (Professional Learning Network), thank you for being so warm and helpful to me. I value your ideas and appreciate your continued support. 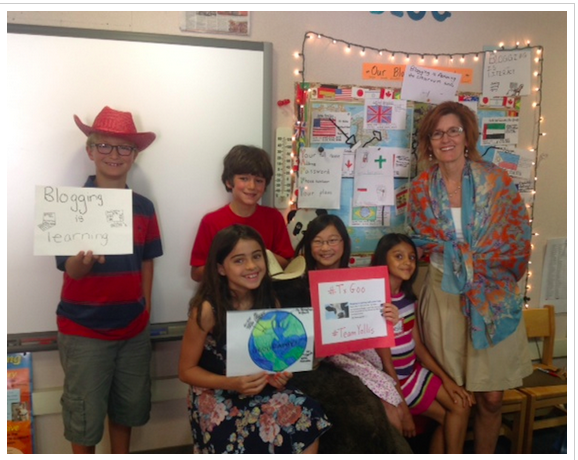 I feel fortunate to be part of such a fantastic global learning community! Friends, in 2015, think about joining our collaborative photo-of-the-day blog, Yollis' 365 Project! We welcome photos from everyone! Nearly 1,000 comments were contributed over the month! 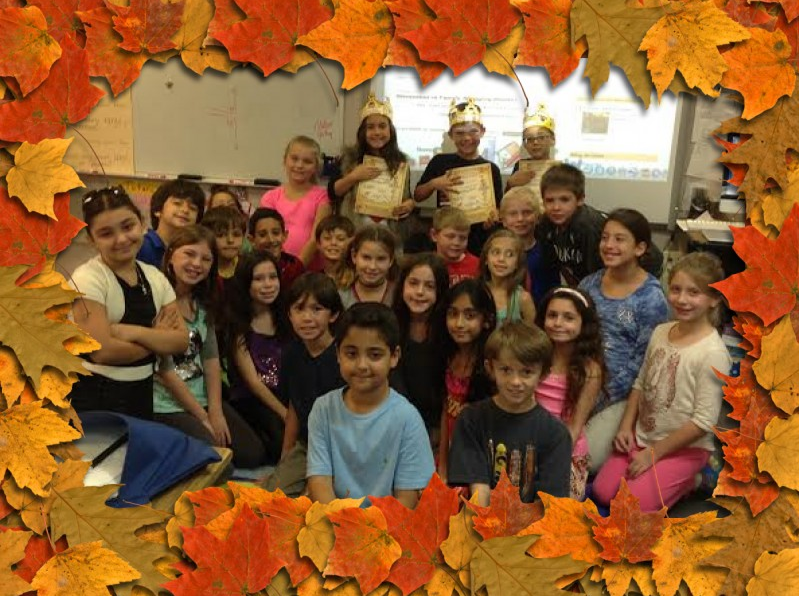 Each winner received a free kid's meal at a local restaurant, a fabulous crown to wear and enjoy, and a free post on the classroom blog! 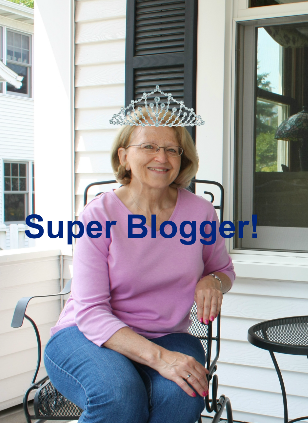 This year exceeded every Family Blogging Month since Mrs. Yollis created the idea back on April 1, 2010! 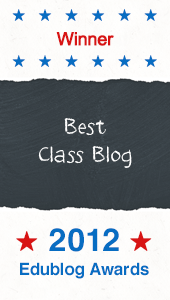 The participation, the quality of the commenting, the interaction and learning that transpired via this classroom blog and the 365 Project makes Mrs. Yollis beam with pride. Not only are her students and their family members becoming superior writers, but they are also honing important digital skills like how to communicate and contribute on line, how to limit personal information on the Internet, and how to develop a dynamic digital footprint. Mrs. Yollis would like to personally thank all the parents and family members for their constant support. Your participation is the key to your child's educational success! 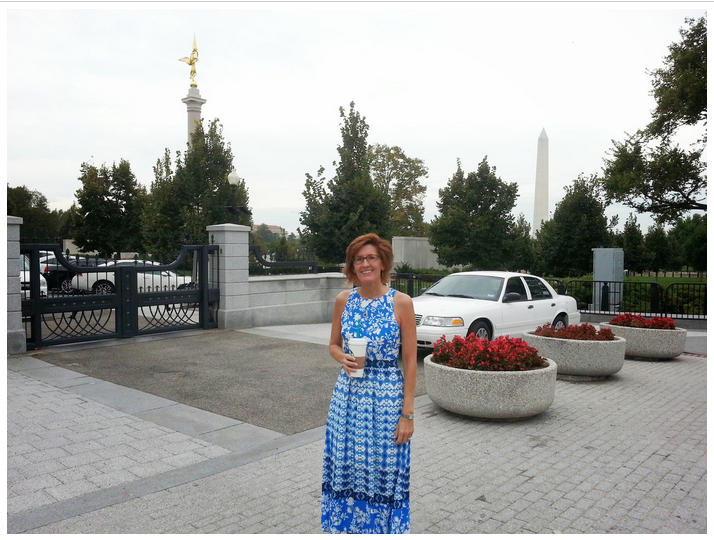 A special shout out is given to Troy's paternal grandmother for her exceptional participation! 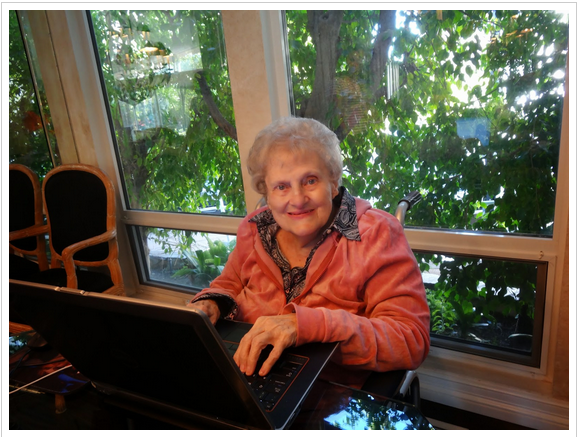 Grandma Barb not only submitted photos to the 365 Project, like her Fabulous Fall Foliage, but she was a major contributor to numerous online conversations. We thank you, Grandma Barb! 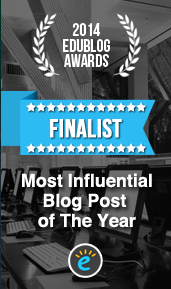 Finally, Mrs. Yollis is proud to announce that November is Family Blogging Month post won Second Place for Most Influential Blog Post for 2014! The post has nearly 100 comments! What was your favorite part of Family Blogging Month? What are some digital skills that you have honed? ❄ Winter Solstice ❄ 3:03 P.M. December 21, 2014! The winter solstice will occur on December 21, 2014, at 3:03 (PST). In the Northern Hemisphere, winter is the coldest season of the year. It begins about December 21 and lasts until about March 21.
the sun's rays fall directly over the farthest point south of the equator. This marks the first day of winter. In regions where there is cold weather, it causes many changes in the environment. 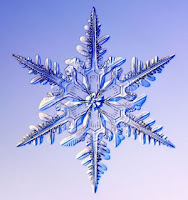 Water may freeze and become ice, snow, sleet or icicles. Sometimes it gets so cold, boiling water will vaporize! Most plants and animals become dormant and rest. Some animals hibernate. The only plants that grow and remain green are evergreens. People protect themselves from the cold climate with winter clothing when they go outdoors. They enjoy a variety of indoor activities or outdoor wintersports such as skiing, skating, or sledding. Here are some fun winter links! 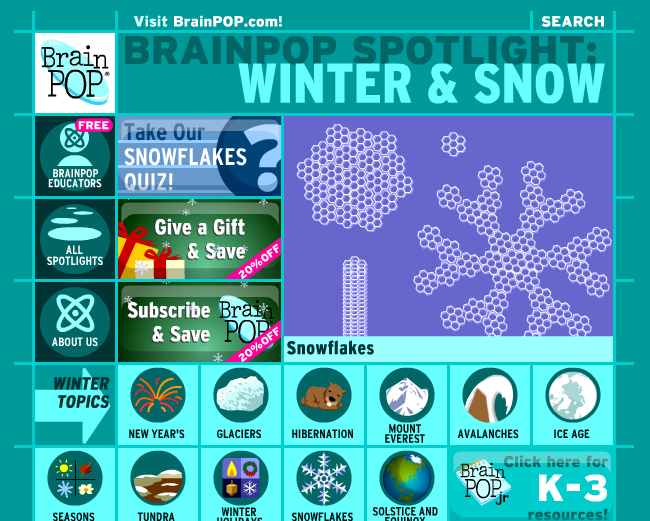 Want to make an online snowflake? Click here! BrainPop has some great winter and snow movies! What do you enjoy most about winter? How will you be celebrating the holidays? What activities will you be participating in this winter break? Our blogging buddies in New Zealand, Room One @ Auroa School introduced us to a fun Maori Hand Game. We loved learning it and have made video for them. We're sorry this video was delayed in publishing! Did we do the correct moves? What are some typical games that you play in your country? Look at those poor students who woke up in a snow globe! He made the best of it and started juggling snowballs! Are you interested in making snow globes with your students? We have been working on the skill of following directions, so here are the directions for making a snow globe! Gather materials: photograph of each student trapped in the snow globe, snow globe template made on card stock, white paper (to glue on for background snow), lined paper to write a few sentences about "If I lived in a snow globe...", scissors, crayons or markers, glue stick, hot glue gun, clear paper plates, and a bag of fake snow. 2. Make the paper background snow and glue it to the snow globe template. 3. Glue the student to the snow. 7. Wait for the glue to cool. 8. Flip the snow globe over to see the student trapped in the snow globe! 9. 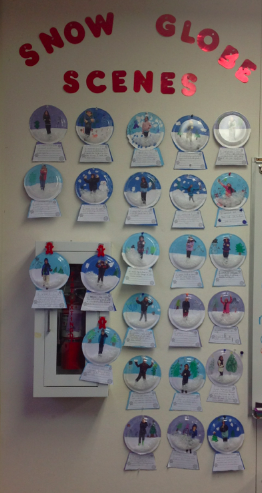 Write a message: "If I lived in a snow globe..."
10. Glue the message to the base of the snow globe. Have fun with your winter wonderland! What did you like about making a snow globe? Tell Nicholas' mom! Have you ever followed directions? What advice to you have about reading and following directions? 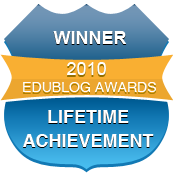 REMINDER: Edublog Award voting is open until December 15. We are nominated in THREE categories. Please consider voting! Click here to give us your thumbs up/like. We have been learning about multiplication. Sometimes we encounter a large multiplication sentence and we don't know the product. We learned a strategy called: Break the Large Array into Two Smaller Arrays and Add the Products. for 5 x 7 = ? Here is another tutorial. Again, it is modeling how to split a large array into two smaller arrays to get the final product. What did you think of the multiplication strategy? What did you think of the tutorial? Give us a large multiplication sentence that we can practice splitting into two smaller arrays to solve. Hour of Code Started Today! 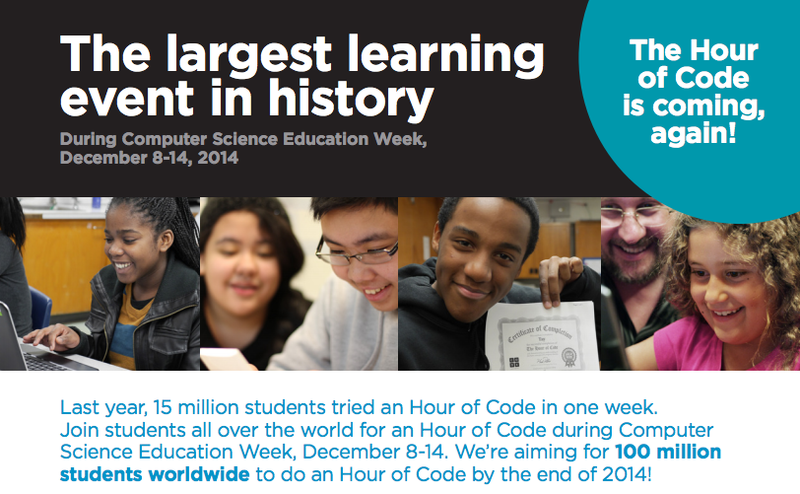 To celebrate, Mrs. Yollis and her students will participate in the Hour of Code! 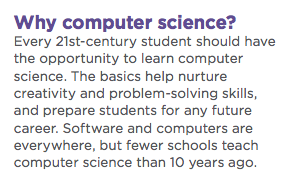 Here are some screenshots from the Hour of Code website. We will be accessing these Hour of Code Tutorials. However, you are free to go to these tutorials at home with your parents. Share what you've learned with the class in the comment section! 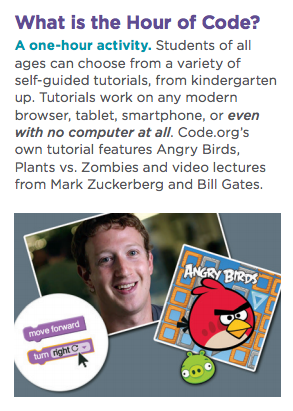 On Monday, we will start our Hour of Code using the Angry Birds tutorial. This tutorial will help us learn the "drag and drop" method of programming as we solve fun puzzles. After solving the puzzles, we can create our own puzzle! 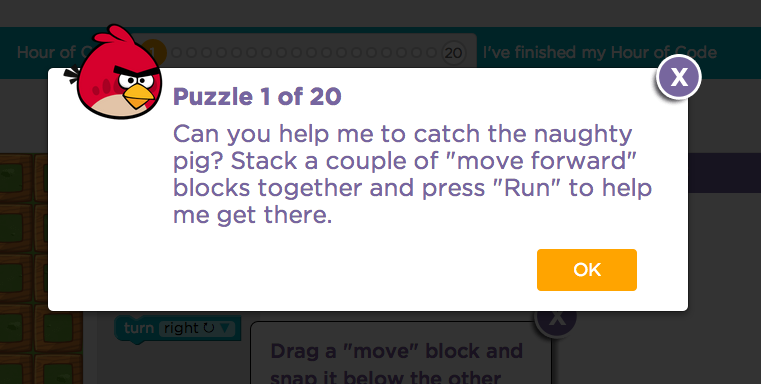 Here is a screenshot of puzzle 1. Here is a screenshot of the opening puzzle. Together we will drag and drop blocks. The blocks will snap together, and then we will run the program. Through trial and error we will persevere and become computer programmers! 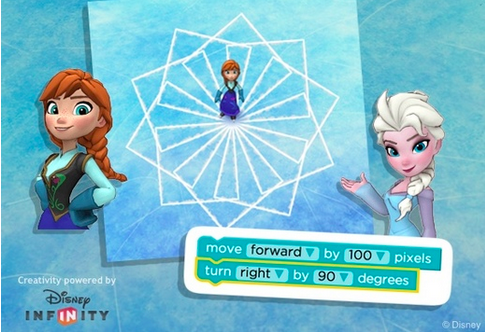 For those who are ready, there is a tutorial using Anna and Elsa! Here are some screenshot I took as I explored the tutorial. Notice verbs like move and turn. What does the term 90 degrees mean? Can Elsa turn more than 90˚? Less than 90˚? We used a paper bird to help us figure out right from left! After we did a few tutorials together, students worked in groups. What did you enjoy about being a computer programmer? Share any tips or definitions that will help us all become better programmers. 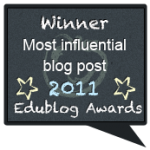 Edublog Awards :: Voting Now Open! 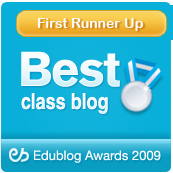 The Edublog Awards voting is open and our class made the shortlist of finalists in THREE categories! Below are the voting boxes. Click on the "thumb". TIP: Be sure THE NUMBER next to the "thumb"
goes UP! If the number goes down, you "unvoted" and will need to click the "thumb" again. Two of Mrs. Yollis' former students are still blogging years later! Miriam and Sarah would love a thumbs up from you! 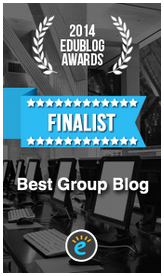 We appreciate your support and are honored to have made it to the shortlist of finalists!